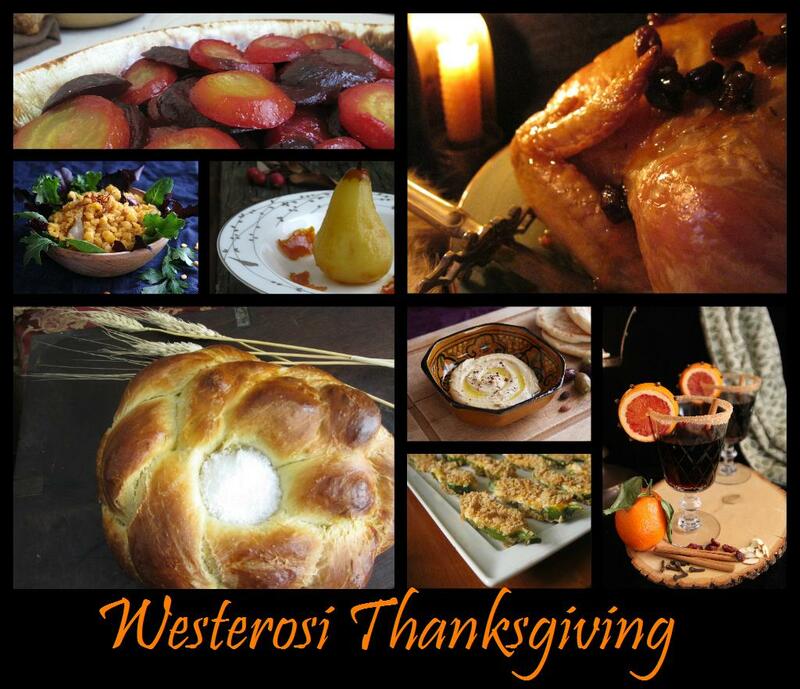 Out of all the holidays in the year, I think Thanksgiving might be the best suited to a Westerosi interpretation. As I started building this list, more and more dishes sprang to mind. Thanksgiving, in many families, is characterized by cold weather, a groaning table laden with an absurd amount of food, and inter-family drama. Sound at all familiar? The list below includes dishes from the blog and cookbook. Personally, I’d eat the heck out of this meal, but how about you? Are you going to smuggle a couple of dishes into your mainstream family’s spread, or are you taking over the holiday completely with Westerosi fare? Let me know if there’s a Westerosi dish you think I should include in this list, or other Thanksgiving-friendly fictional dishes and let’s get to scheming! I tripled the quails in butter recipe to cook 4 turkey thighs (bone in, skin on) for my Canadian Thanksgiving. It was amazing. I also made the pearl onions in gravy, which absolutely stole the show. For the first time in my life, stuffing was the least exciting part of the meal. I think you should add the duck with cherries and lemons recipe. We are planning on throwing a Game of Thrones Thanksgiving dinner with our friends, and I think we might make the duck recipe instead of a turkey. You could also add a ham recipe, which might be amazing. We are also preparing duck as our main dish, and perhaps Sister’s Stew for our pescatarian friends. Any other fish suggestions? The cod cakes might be a nice traditional addition to the holiday spread! There needs to be some tart fruity thing, like a variant of cranberry sauce. Citrus relish? Ooh, great call, Rosey! I’ll put it in! I made onions in gravy, from the book, for my family’s Thanksgiving. They were a hit. Definitely include them in the spread.